MANILA, Philippines - Chinese star Hangeng, former member of K-pop boy band Super Junior, won the Favorite Asian Act award at Nickelodeon's 26th Kids' Choice Awards. Fans chose Hangeng over Korean rapper Psy, the Philippines' Sarah Geronimo and Malaysia's Shila Amzah for the award. He is the first artist from China to win in the KCA. 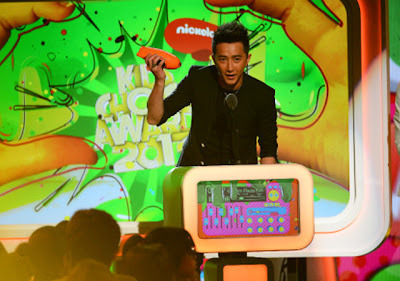 Hangeng attended the Kids' Choice Awards ceremony in Los Angeles on March 23 (March 24 in Manila) to receive the award -- an orange Nickelodeon blimp. In his video message posted on the Nick Asia website, Hangeng thanked fans around the world for voting for him. "I'm very happy to be in LA and be part of this ceremony and to be able to party with the kids. Thank you to the fans around the world for their support and votes." He added that he hopes to return to LA. "And I hope to have more chances to come to LA and party with more kids," he said. Nickelodeon described Hangeng as the "the most influential male celebrity in China." "His 1st solo album sold over a million copies & tickets to his 1st concert sold out in a record-breaking 37 mins. He is also exceptionally well known for his powerful dance skills and skillful in all of China's 56 ethnic traditional dances, ballet and hip-hop," according to Nickelodeon. Last November, Hangeng won the Best Worldwide Act in the MTV Europe Music Award, edging out Rihanna, Restart, Ahmed Soultan and Dima Bilan. He won his ticket to the MTV EMA by bagging the Asia Pacific Worldwide Act. This year's Kids' Choice Awards ceremony, held at the Galen Center at the University of Southern California in Los Angeles, was hosted by Josh Duhamel. Nickelodeon said 387 million votes were cast around the world in 22 categories. Since becoming a solo artist in China in 2010, Hangeng also ventured into acting. He has since become one of China's most popular celebrities. Among this awards include being named as Mainland China's most popular male singer in the 2011 Channel V Music Awards. He also won the Golden Song of the Year in the 2011 Baidu Entertainment Hottest Awards and Eastern Billboard Annual Awards. Favorite TV Show - "Victorious"
Favorite Reality Show - "Wipeout"
Favorite Cartoon - "SpongeBob SquarePants"
Favorite TV Actor - Ross Lynch - "Austin & Ally"
Favorite TV Actress - Selena Gomez- "Wizards of Waverly Place"
Favorite Movie Actor - Johnny Depp for "Dark Shadows"
Favorite Movie Actress - Kristen Stewart for "The Twilight Saga: Breaking Dawn - Part 2"
Favorite Animated Movie - "Wreck-It Ralph"
Favorite Voice from an Animated Movie - Adam Sandler for "Hotel Transylvania"
Favorite Male Buttkicker - Dwayne Johnson for "Journey 2: The Mysterious Island"
Favorite Female Buttkicker - Kristen Stewart for "Snow White and the Huntsman"
Favorite Villain - Simon Cowell for "The X Factor"
Favorite Videogame - "Just Dance 4"